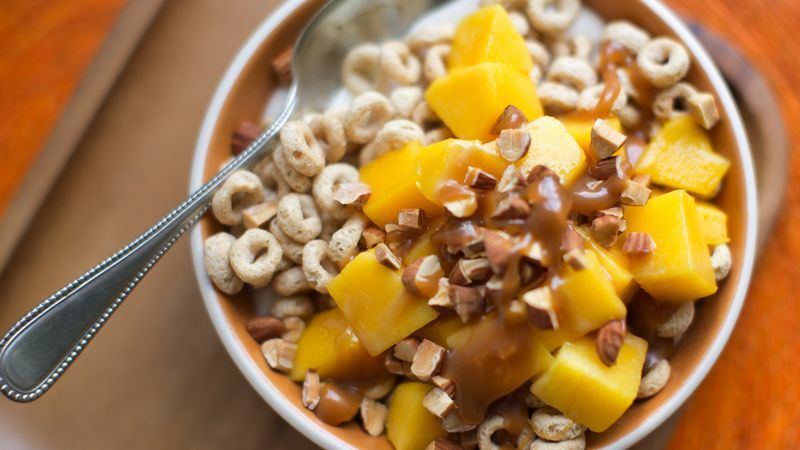 Top with cereal, mango and almonds. Drizzle with caramel; sprinkle with salt. Serve immediately. To ripen a mango, place it in a paper bag at room temperature. Ripe mangoes can be placed in a plastic bag and refrigerated for up to 3 days. To cut a mango, start by using a sharp knife to cut the fruit vertically in half along each side of the seed. Twist the two halves apart, and cut away any remaining flesh. Then score the mango flesh in each half in crisscross pattern, being careful not to cut through the skin. Flip each half inside out, and remove the square pieces from the skin.